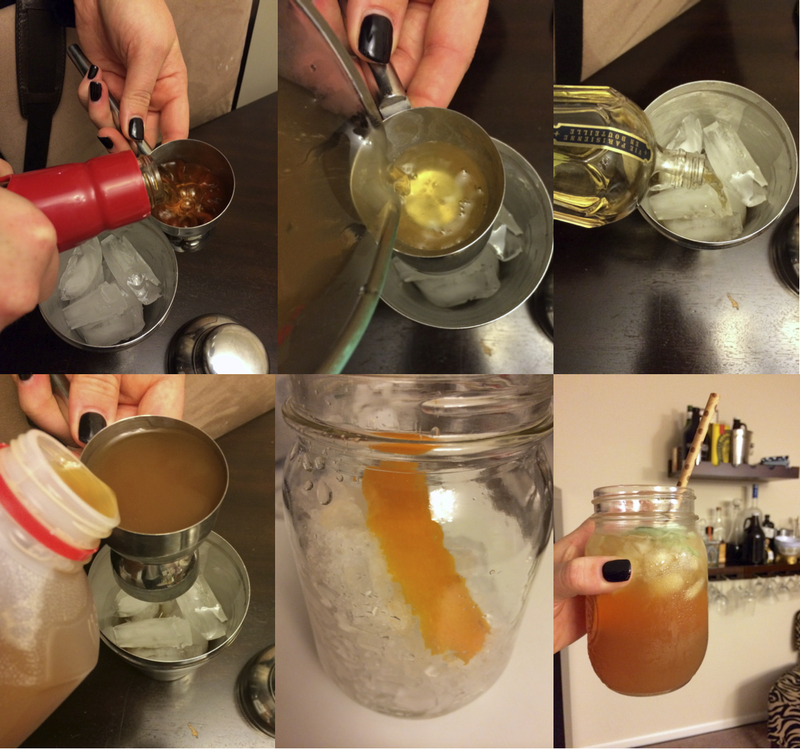 As a lot of you already know, I love to experiment with different simple syrups + cocktails, you can see all of them here. There is nothing better to me in the fall then sitting out on the back patio (when the weather allows it, of course!) and enjoying a nice drink that warms you from the inside. 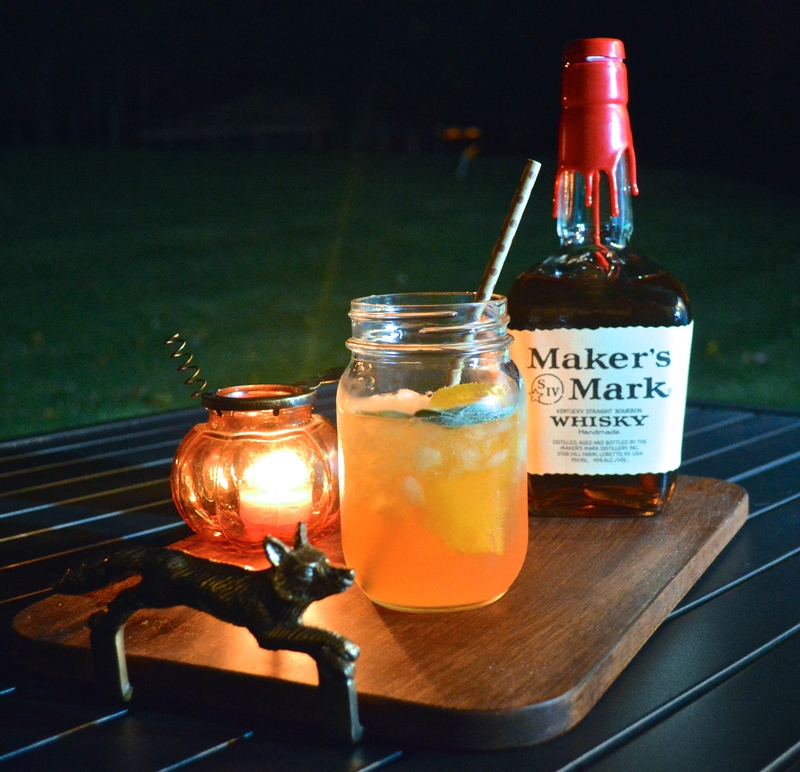 We had a warm weekend a couple weeks ago and I wanted to make a new bourbon cocktail for the fall. I made a simple syrup with orange peels, sage leaves + local orange blossom honey which was the perfect mix of sweet from the honey, brightness from the orange peel + warmness from the sage. I shook it up with some bourbon, St. Germain’s + apple cider and it’s fall in a jar! This would be fantastic to make into a big pitcher and serve at a party or keep the simple syrup on hand in your fridge for a cocktail anytime you want! Combine 1 cup of water + 1/2 cup orange honey in a small saucepan. Heat to a boil + then immediately reduce to a simmer and add handful of fresh sage leaves + pieces of peel from 1 orange. Simmer for 2 minutes, remove from heat and let steep for 5 minutes, then strain and let cool. Fill your shaker with ice and add 1 shot bourbon, 1/2 shot simple syrup, a splash of elderflower liquor, a shot of apple cider + shake everything up. Fill a jar (or glass) with some crushed ice and an orange peel and pour in the mixture. I topped mine with a splash of club soda but you can drink it as is! If you want another incredible fall cocktail, try my apple cider bourbon mojitos! This sounds amazing! My pet name for my husband is honey bear too so I might just have to make this for him! This looks incredible! We tried a similar cocktail while we were in Charleston this summer, but now I’m so glad to have a recipe so that I can try it on my own! Yum! Thank you! Yum, love the mason jar!! Love this! I’m going to share it with my client, the National Honey Board. Looks delicious! You will LOVE it Jocellyn!